The Redmen football team, which has existed as the “Redmen” for almost 50 years according to the Tewksbury Historical Society, is heading into what could very well be its 4th state championship, and so the Tribune thought it may be a good idea to review the history of the Redmen in terms of their current and past record, as well as their cultural impact on the town of Tewksbury. Tewksbury High was founded in 1935, and prior to 1935 Tewksbury students attended Lowell High School, and Redmen football was seemingly first referenced in 1969. The Redmen name came as a reference to the Native American tribes once present in the area that is now Tewksbury, an arguments today rage on about whether the name is an honor or an insult, and the name even survived a town hall referendum on renaming in 2016. The team has also survived being moved into different divisions in the past decade, and adapting to a new High School. One of the most recent developments for the team has been their playing of games at their home stadium, Doucette field, under the lights. Ever since 1974, the Redmen football program has been reliant on the Aylward family for leadership, as well as strong players. Bob Aylward coached from 1974-1996, seeing 5 super bowls, including a win in 1985 with 2 of his sons (Rob at quarterback and brian at fullback) playing on the team at the time, and a 1996 win against Walpole in his final year. Succeeding him was his son Brian, whom player and students alike affectionately call B.A., who has served as coach up to the present day. He has lead the team to a superbowl win in 2013 against Marblehead, where his own son, Johnny Aylward, played as Quarterback. B.A. has also lead the team to winning several league and sectional championships. In addition to being a very respected name in the state for High School football, My. Aylward has also touched students as the teacher of the A.P. U.S. Government and Politics class, and has become a fixture in the community at large. This year, the Redmen have made it to the Division 3 Superbowl, which will be held on Friday, December 1st at Gillette Stadium and the players are in good spirits after a Thanksgiving win against their annual rival Wilmington. With Senior Jay Connolly at QB, the Redmen have had an overall record of 11-1 this year, and just beat superbowl rival Duxbury to make it here. The Redmen were defeated by Central in well played game that ended with a score of 20-7. Although a defeat, the Redmen took pride in the fact that they kept Central from achieving their usual 40+ points. 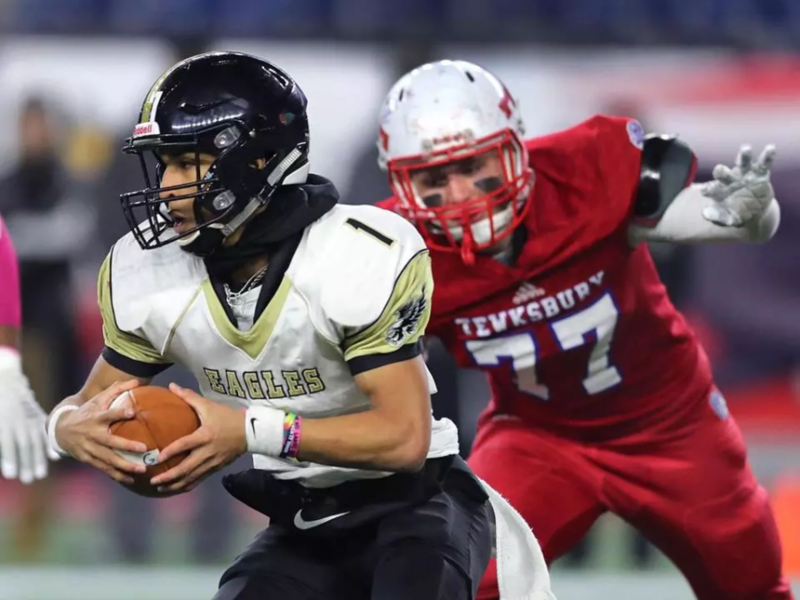 Notable moments include Golden Eagles QB Isaac Boston finding a receiver in the corner of the endzone to score their second touchdown, Kyle Zervas scoring Tewksbury’s only touchdown after Tewksbury was trailing 13-0, and a recurring chant for Shane Aylward to “Tie those shoes!”.